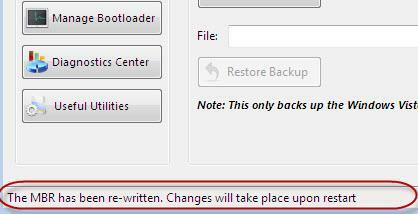 In 2007 we published an article about how to uninstall Windows Vista when you have a dual boot configuration. 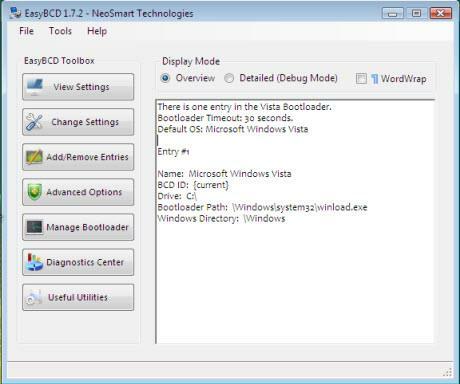 In that article we were using VistaBootPro to remove the boot entry for Windows Vista. However, this tool is no longer free and many of our readers requested another alternative. In this new guide, we will show you how to do the same using EasyBCD, a tool which works just as well and it is free. NOTE: This guide works for people that have a dual boot configuration: Windows XP and Windows Vista installed. Important: EasyBCD works only on Windows Vista. This means that you will have to download and install the application while you are still using Windows Vista. You can download EasyBCD from the NeoSmart site or from Softpedia. After you install it, run EasyBCD. The interface will look like in the below screenshot. Click on the Manager Bootloader button. 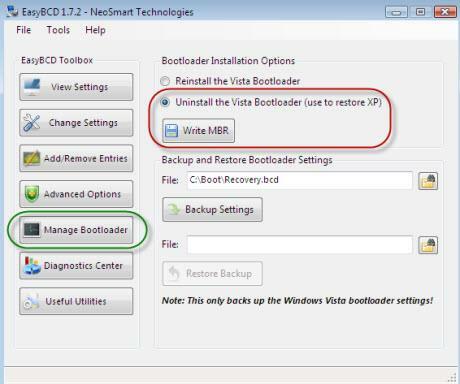 Then, in the 'Bootloader Installation Options' section, select 'Uninstall the Vista Bootloader' and click on 'Write MBR'. When done, you will see in the status bar of EasyBCD that the MBR has been re-written. Now close EasyBCD, restart your computer, login to Windows XP and format the partition where Windows Vista was installed. To learn how to do this, check the second half of our initial article on how to uninstall Windows Vista. If you know other free tools which do the same thing as EasyBCD don't hesitate to share them with us. I already had vista on my laptop but installed windows vista premium cos i cudnt play games on my laptop so thought id try it but now its deleted all my drivers inlcuding my wifi driver so i cant get on the internet how can i uninstall it to the way it was 3 days ago?